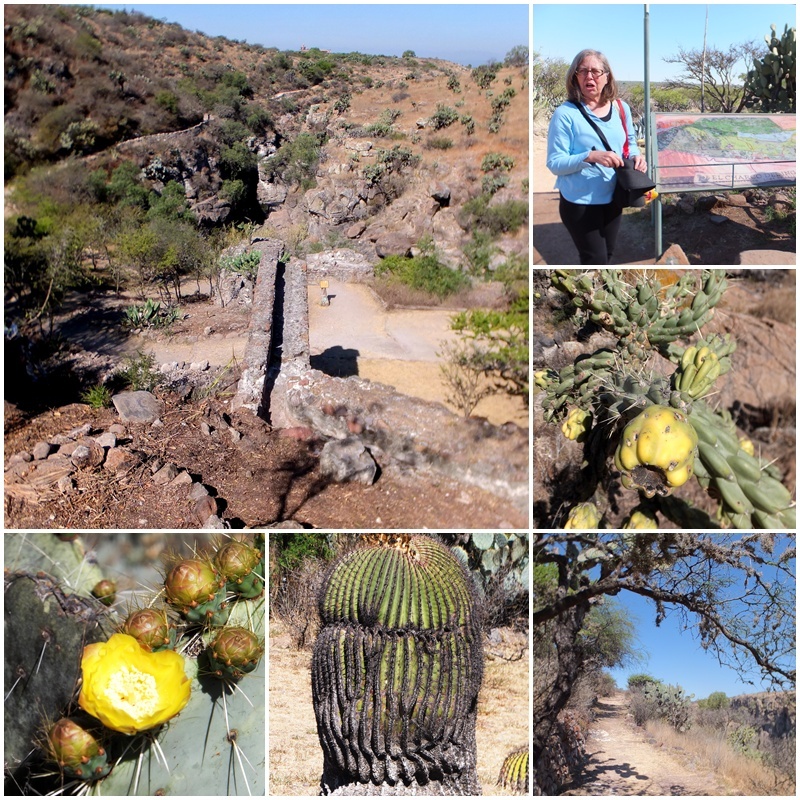 The sun was already beaming down from a blue sky on March 4, 2014 when I set out to explore another interesting destination in San Miguel de Allende: “El Charco del Ingenio”, the city’s botanical garden. Our expert guide Laurie who hails from Oregon via San Francisco, was already waiting to take us on a guided tour through this unique facility. Located on the plane above San Miguel, this botanical garden shows off the unique semi-arid eco-system that prevails in this area. The botanical garden is located next to the Reservoir Dam that was built in the early 20th century to supply electricity to the La Aurora textile mill. A big iron pipe still serves as testimony to this industrial connection. Stone ruins from a centuries old water mill can also be seen here, proving that the water of the stream that existed here has been harnessed since colonial times. Laurie provided great explanations of the various cacti and succulents that naturally grow here in the canyon. I was surprised by the biodiversity that can be found here in this semi-desert like environment. 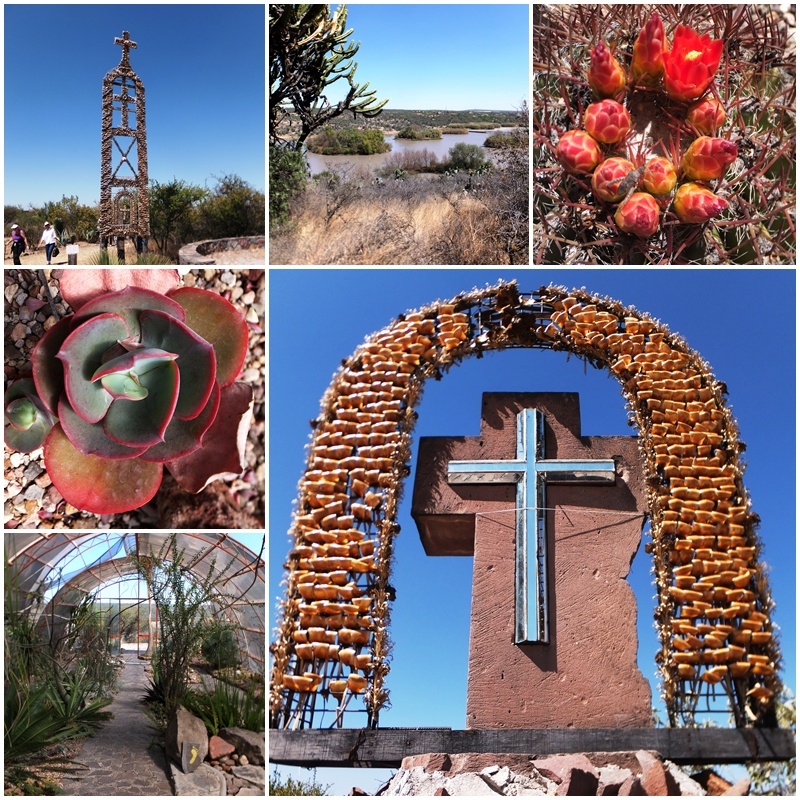 As we finished our walking tour of the canyon area at the Botanical Garden of San Miguel de Allende we arrived at a gathering area with two crosses and symbols embedded in the payment that represent the four elements (earth, water, air and fire). The botanical garden is a non-profit organization that also provides educational program to school children and a greenhouse showcases an outstanding collection of cacti, succulents and other indigenous plants. In 2004, the El Charco del Ingenio botanical garden was proclaimed a Peace Zone by the Dalai Lama as one of five areas in Mexico that are free of violence and arms and dedicated to the conservation of nature and community development. 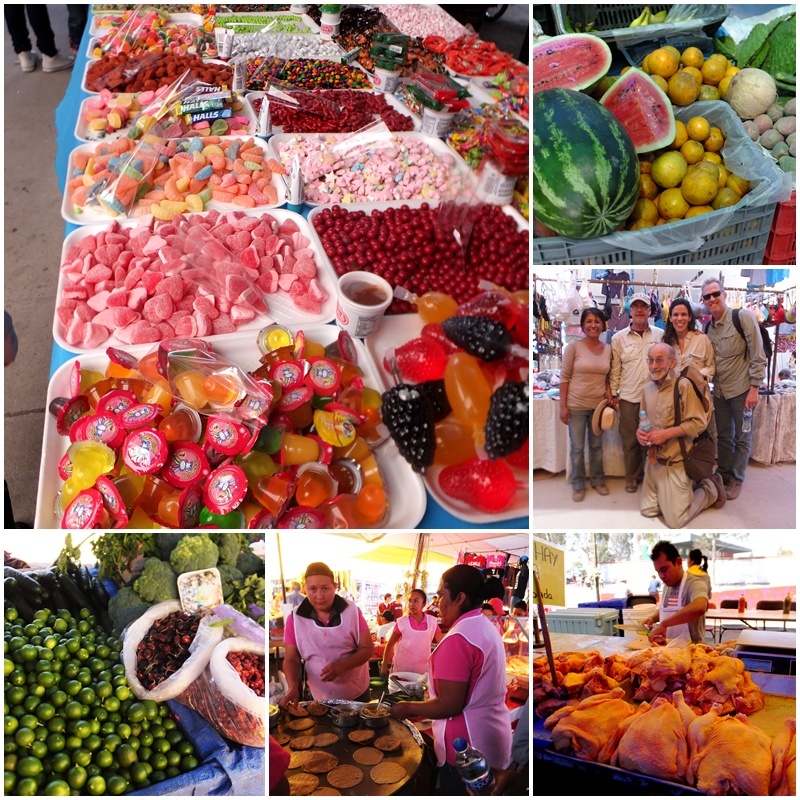 Every Tuesday the “Tianguis del Martes” (Tuesday market) takes place on the outskirts of San Miguel de Allende. Hundreds of itinerant vendors come and set up their temporary tables, covered by tarpaulins, and start selling everything from fruits, vegetables, fish and meat to clothing, accessories and a wide variety of other merchandise. The Tianguis del Martes is also a great place to meet friends and I bumped into Bill LeVasseur, founder of San Miguel’s Mask Museum and owner of the La Casa de la Cuesta bed and breakfast who I had interviewed the day before. He had gone hiking in the mountains east of San Miguel with a local Mexican guide and three American tourists. Now they were ready to sit down and eat some tortillas with braised pork and invited me to join in. 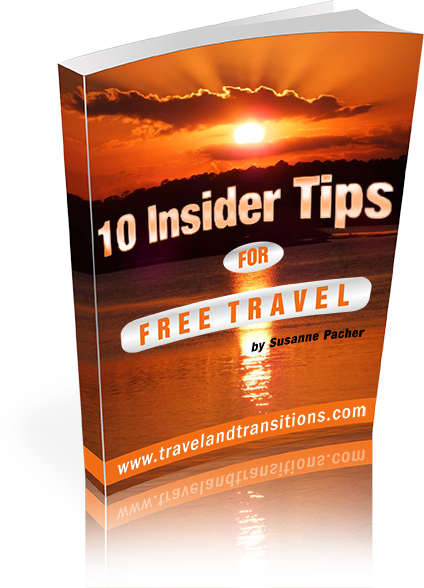 We had a delicious meal and a great conversation, all in the spirit of the friendliness and openness that so prevails in San Miguel de Allende. I have noticed it’s very easy to make friends here. After my visit to the colourful Tuesday market of San Miguel de Allende I took the bus back downtown and stopped in at Bici-Burro and chatted with owner Alberto Martinez who owns this bicycle shop and also provides bicycle tours throughout the area. He explained that there are great opportunities in the San Miguel area for exploring the local natural environment as well as many historical locations and former haciendas by bike. I love bicycling and would have enjoyed an opportunity to head out on two wheels but there was just not enough time during this stay for me go on a bike tour. Then I headed back downtown and right adjacent to the magnificent Parrochia (parish church) of San Miguel I sat down for dinner in the romantic courtyard of the colonial-style Posada Carmina Hotel. Finally, I bumped into a lively Mardi Gras procession that came to a raucous stop in front of Hank’s Restaurant, a New Orleans-style eatery that is a fixture in San Miguel’s entertainment scene. 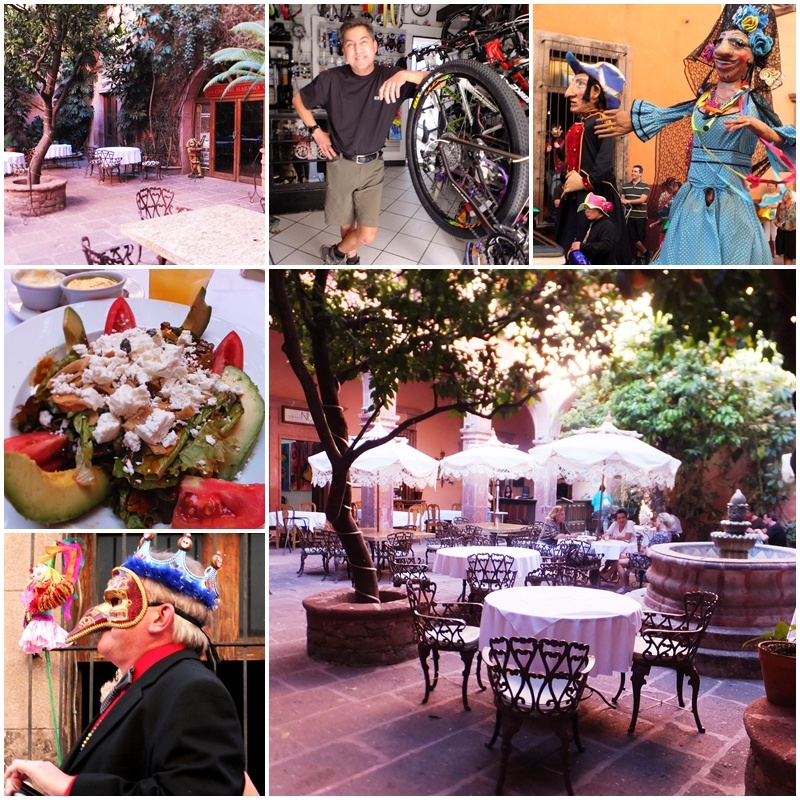 One thing is for sure – you’ll never get bored in San Miguel de Allende.